In his introduction to the Nuclear War text, Simon Stephens explains that as a playwright, he does not want directors and performers to revere him. Rather, he wants them to see his scripts as a starting point for their own creativity. 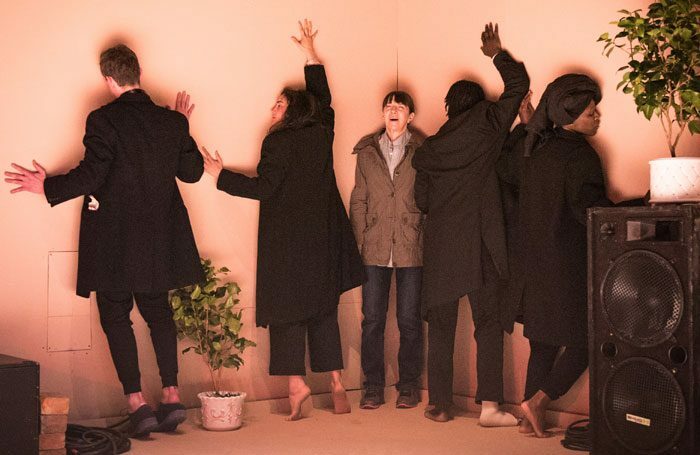 The third line of the stage directions is, ‘a series of suggestions for a piece of theatre’; from these suggestions, choreographer-director Imogen Knight shapes a haunting landscape of physicalised despair. Alone in London, a grieving woman is alternately helped and hunted by a four-strong pack of figures in black who create the landscape she aimlessly navigates – the underground, a cafe, the high street. She speaks of the anniversary of someone’s death – a partner, a child, a parent – who is now a heavy, ever-present shadow. Some moments in her day aren’t particularly notable, others are devastating, all are visually striking. The work feels laden with meaning and the unnamed woman’s grief is thickly tangible. Maureen Beattie is excellent in the leading role. The haunted disconnect with which she navigates life is utterly convincing. It’s impossible to not watch her and relate to her struggle on some level. The rest of the cast are physically versatile, with a vocabulary ranging from threatening to comforting. The agility with which they clamber over a precarious set of everyday home furnishings and dance round a makeshift alter teeters on the edge of descending into chaos or violent destruction. Knight’s precise choreography combined with Stephens’ text toys with the fabric of time and space, threatening to rip it to shreds. It’s a tense, heavy work, but deliciously so. At 45 minutes, the piece feels thrillingly experimental in concept (for this country), even if the form itself isn’t. There’s an edgy freedom reminiscent of Anthony Nielson’s Unreachable, another work with an unconventional approach to theatre making at the Royal Court. But would not knowing this background information diminish the play’s power? Perhaps – being aware of its processes certainly gives more weight to Knight’s role. It’s crucial that we’re seeing work made with more unconventional methods outside of the fringe, and the Royal Court should be commended for fostering it. It’s a worthy experiment, but the piece’s brevity evokes an experiment rather than something definitive and finished. It teases without fully satisfying. Regardless, Nuclear War taps into the elemental truth of grief and its impact on perception of the world around you after a seismic loss. Nuclear War runs through 6 May.